Raptors, also known as birds of prey, are a diverse and fascinating group of birds which have all adapted to a life of eating meat. Raptors include Eagles, Hawks, Owls, Falcons and Vultures and within each group there can be found a great deal of variety in form and behavior. Though incredibly diverse, all of these raptors will possess three important characteristics; keen eyesight for spotting prey, powerful curved talons for capturing and gripping prey and a curved beak for tearing food into smaller pieces. Raptors play an important role in the environment as key predators and scavengers and are some of the most important natural vermin control mechanisms. Here at the Center for Wildlife Education we have a vast collection of birds, from the tiniest of Screech Owls to large and majestic Bald Eagles. Here you will find a sampling of our raptors and more await you at your visit to The Center for Wildlife Education! Please note: All of our birds are unable to be released into the wild due to injuries or behavioral handicaps. Hawks are the archetypical raptor. They inhabit many habitats, from arctic tundra to arid deserts and dense tropical forest. They are typically active during the day and prey upon a variety of animals. Locally, Red-Tailed Hawks are a common sight along the roadside and at the forest’s edge, where they hunt for mice, rats, squirrels and rabbits. They have very keen vision and generally wait atop a high perch for signs of prey on their area. Then, with great power and precision, they drop upon their prey with razor-sharp talons. The Raptor Walkway at the raptor center features some of Georgia’s native hawks in their natural habitat. At the forest’s edge, meet Anna, the Red-Tailed Hawk. Anna has been with the Center since its founding and is blind, though she would not survive in the wild, here at the center she has a full belly and plenty of fresh air. You’ll also meet Scarlet the red-shouldered hawk in the wetland habitat along the nature walk. In our flight show, be prepared to be amazed by the flights of our trained Hawks. 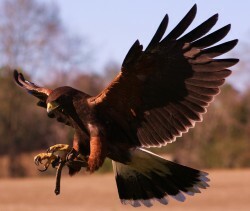 Our show includes Red-Tailed Hawks, Red-Shouldered Hawks and one of our real stars, the Harris Hawk. This bird is a real character and always brings his own brand of humor and fun to the shows. He’s used to being in the limelight though; he was once a mascot for the Atlanta Hawks! Few birds have mastered the task of living at night, and none nearly as well as the owls. Long considered a creature worthy of legends and myths, owls have fascinated humanity for years. Their piercing, enormous eyes are both beautiful and vital to their role as a nighttime predator. Owl night sight is amongst the best, allowing owls to operate in very little light. Their hearing is also amazing, with some owls able to hear sounds as faint as a mouse’s heart beat buried under snow. Though long hailed as “The Wise Old Owl”, owls are actually not the biggest thinkers of the bird world. Nevertheless, owls are amazing predators and their mastery of the night is worthy of awe and adoration. 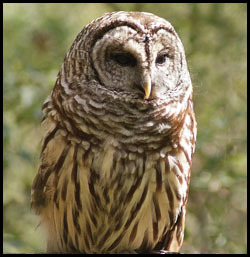 The Center for Wildlife Education’s raptor center is home to many species of owls, including native species and those from overseas. On our raptor walkway, you’ll encounter Barred Owls, Great Horned Owls and Eastern Screech Owls in their native habitats. Be sure to check out our Barn Owl Barn where you can get up close and personal with the species most commonly found living amongst humans worldwide. 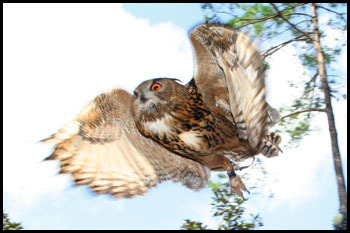 Our collection includes several flight-capable owls as well, including a Barred Owl, Great Horned Owl and a pair of majestic Eurasian Eagle Owls. In our flight show program, these beautiful birds will demonstrate some of their amazing adaptations to life at night, including silent flight and their incredible mobile necks. Also soon to come to the show, a beautiful visitor from the north: a trained Snowy Owl! Falcons are amongst the most agile of birds. Instead of relying on strength, they depend upon complex aerial maneuvers. 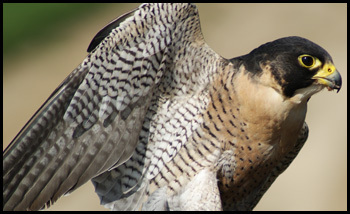 Generally, Falcons are smaller than hawks and have smaller beaks and talons. Their wings are sharply pointed and narrow to provide them with the maneuverability they need to capture prey. Forest falcons will often pursue their prey, even into deep cover, narrowly avoiding tree trunks, branches and brambles where larger, clumsier birds could not venture. In the mountains and plains, Peregrine falcons employ a very extreme hunting method known as a stoop. The Falcon first spots its prey from a high altitude, often a duck or pigeon. Then, it plummets from great height, accelerating with carefully timed wing beats, reaching speeds of up to 180 miles an hour. When it reaches its quarry, instead of seizing it with its talons like other birds of prey, it balls up its talons and hits it’s prey like a feathered cannonball! One of the first birds you will find on our raptor center walkway is the American kestrel. One might mistake this little falcon for a songbird, because he is no larger than a robin and colored in beautiful slate grey and rich orange with prominent black markings. However, this little falcon is a skilled predator, using advanced UV vision and skillful hovering to capture mice, voles and other small rodents. 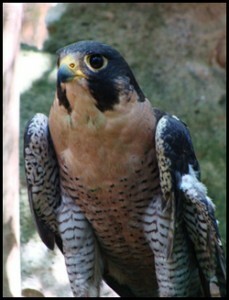 You’ll also find our peregrine falcons in the mountain habitat. Get an up close view of these amazing predators that were nearly wiped to extinction in America due to the use of DDT. However, the species has made a remarkable recovery thanks to the banning of DDT and reintroduction. You might even see some of these birds living amongst the skyscrapers in Atlanta! 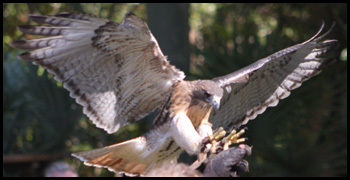 In our flight show, you’ll see the acrobatics of our falcons, including our American Kestrel, and a Eurasian Kestrel. The Eurasian Kestrels, also called Common Kestrels, are slightly larger and not so brightly colored as our native variety. These birds can turn on a dime and ounce-for-ounce have the strongest feet of the birds of prey. M-F: 9 a.m. – 4:45 p.m. Sat: 1 p.m. – 4:45 p.m.
Sun: Closed to the public.